When you want to print the report, move to the place between the couple in a diagram by the cursor of mouse. The couple should be in blue boxes. Below the cursor of mouse you will see icon printing. Click on it. 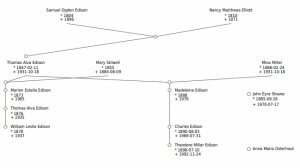 There are two basic types of reports: Vertical ancestor chart and Descendant chart. It is very important to click on the right couple before printing. Your report will get started from that couple. Except of these two types (Vertical ancestor chart and Descendant chart) you will find there the book of family trees, calendars, different kinds of lists etc. It is printed from the bottom up. In this type it is the best to start with the youngest generation. Click on it. Automaticaly the report will start getting printed from the youngest generation, and will continue with their parents, grandparents etc. You can create beautifull shapes of the trees using a Vertical ancestor chart. But you will not see that many people in this type of report like in Descendant chart. Is is printed from the top down. In his type it is the best to start with the oldest generation. Click on it. Automaticaly the report will start getting printed from the oldest generation, and will continue with their children, grandchildren etc. Descendant chart is used to show as many people as possible. The shape of the tree is not automaticaly generated because its shape depends on the number of children, grandchildren etc. If you want to make a present for your relatives or friends, make a book of family tree. It depends on the couple which you want to start with. Start printing from the youngest generation. Choose which type of report is the best to use, to create the book of family tree. As a result you will have several numbered pages. There will be a family tree on every page. You will find the numbers next to the names on family tree. They represent numbers of family trees with details on certain page. When you finish, you can print it and a beautiful present is done.